Nick Rossman, left, visiting from Watertown, South Dakota, shows off a full-sized migratory tarpon, caught April 10 on a threadfin herring along the beach with help from Capt. David White of Anna Maria Charters. 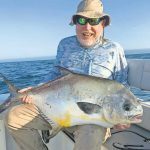 Logan Wallace of Renton, Washington, shows off a giant jack crevalle and the popper it ate April 7 on a fishing trip with Capt. David White of Anna Maria Charters. College friends Mackenze Genauer of New York City, left, Dylan Callahan of Connecticut, Will Trepp of New York City, and Sam Jordan and Scott Culliname, both from Colorado, show off the fish trout and mackerel they caught nearshore using live shiners. They were guided by Capt Warren Girle. 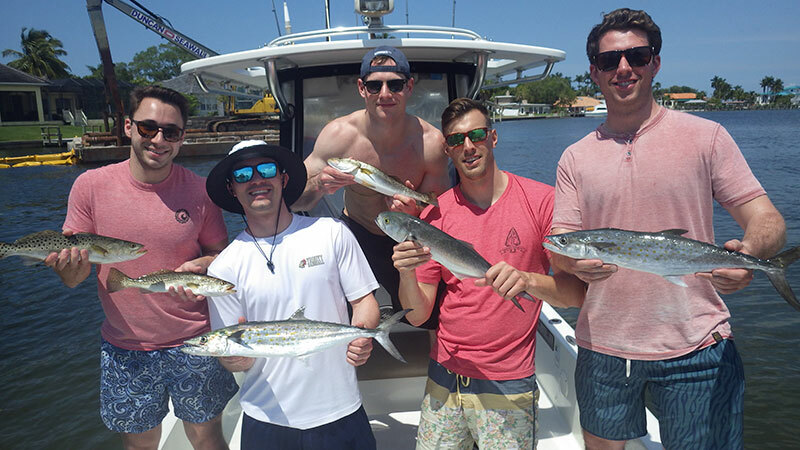 Springtime fishing around Anna Maria Island is impressive. Inshore and offshore fishing is providing some of the best action of the year. While fishing offshore, anglers are enjoying an influx of migratory species — blackfin tuna, kingfish, bonito, amberjack, cobia and, just starting to come on — tarpon, the silver king. 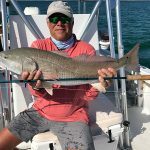 Bottom fishing while offshore is hot with red grouper and mangrove napper. Moving inshore, catch-and-release snook fishing is about as good as it gets. Just make sure you plan accordingly — good moving tides, clean water and plenty of white bait should get the job done. Catch-and-release redfish are making a good showing as well. Again, tides, water and bait play major roles. If you’re looking for table fare, spotted seatrout and Spanish mackerel are available and, if you’re lucky, you might come across some flounder. On my Southernaire charters, I’ve been enjoying the catch-and-release action on snook and redfish. 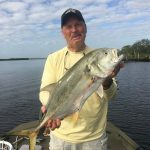 Both experienced and novice anglers are enjoying catching these species — especially the snook. Rallies of 30-40 linesiders on a four-hour charter, which is great action for those sport fishers who just want the thrill of bending a rod. Spotted seatrout are accommodating. Free-lined live shiners cast over deep grass areas can attract trout 12-20 inches, with a few bigger ones in the mix. Also, fishing structure in Tampa Bay is producing good action on Spanish mackerel. These fish can travel 45 mph when they strike a bait. When this occurs, they practically rip the rod right out of the hands of unsuspecting anglers waiting for a bite. Not only is this thrilling, Spanish mackerel are quite good on the plate. I recommend serving them the same day for the best flavor. Capt. 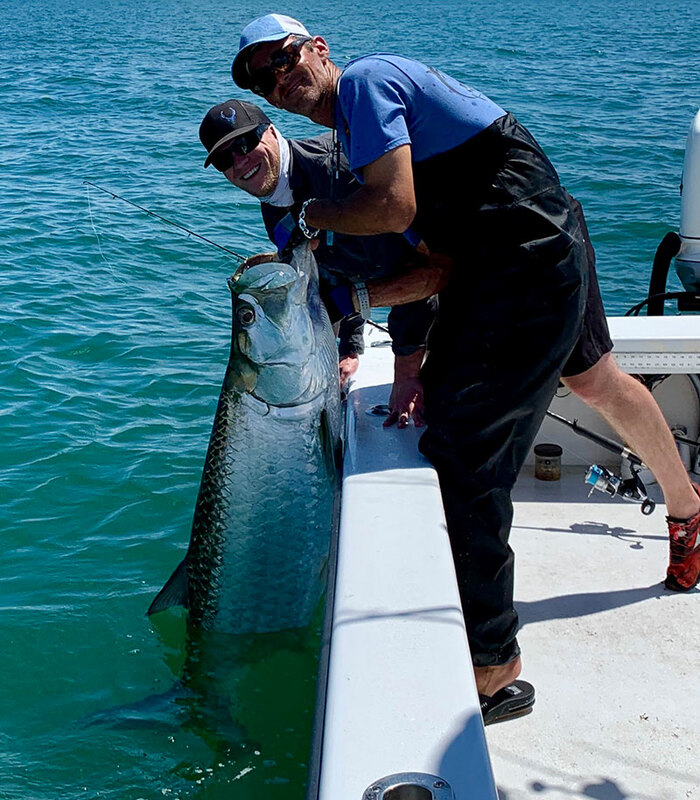 David White of Anna Maria Charters found his first tarpon hookup April 10 and it was a big one. “Right time, right place,” he said, after finding a few schools of silver kings migrating along the beaches of Anna Maria Island. White also is finding success for his anglers offshore, where blackfin tuna are taking his bait from depths of 60-120 feet of water. Cigar minnows and Spanish sardines are attracting these feisty fighters to the hook. Kingfish are another species being found offshore and are attracted to the cigar minnows and sardines. Bottom fishing is producing action — especially on red grouper and mangrove snapper. Both are taking live and frozen baits. Moving inshore, White’s anglers are free-lining live shiners on the flats for a variety of species. Catch-and-release snook and redfish are cooperating nicely. Spotted seatrout also are in the mix. On and around nearshore wrecks, free-lined shiners are being devoured by hungry Spanish mackerel. Jim Malfese is seeing an abundance of fishers at the Rod & Reel Pier. In fact, they’re standing shoulder to shoulder, rods in hand, hoping to hook the big one. And, as far as big ones go, catch-and-release snook are probably the best bet. Not so easy to catch though. Casting silver spoons or small white jigs is resulting in Spanish mackerel, jack crevalle and a few ladyfish at the pier. Live-bait fishing with shrimp is yielding flounder, sheepshead, black drum and some catch-and-release redfish. Capt. Aaron Lowman is finding success for his charter customers on the shallow grass flats of Tampa Bay. Catch-and-release snook fishing is at its peak, and Lowman is producing his share of hookups. Free-lining live shiners is resulting in snook 20-30 inches and some catch-and-release redfish. He’s putting fishers on spotted seatrout while on the flats. These fish are being found in slightly deeper water than the snook and reds. Deep grass areas are holding trout as well as some macks. Capt. Warren Girle is guiding clients nearshore, with good results on Spanish mackerel and kingfish. Free-lining live shiners over reefs and other structure is proving to be prosperous. 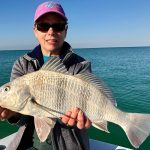 Bottom fishing with shiners is working well around the reefs for mangrove snapper and a few flounder. Moving back inshore, catch-and-release redfish and snook are rounding out the bite. Keeper spotted seatrout also are being caught in descent numbers while inshore fishing. Capt. 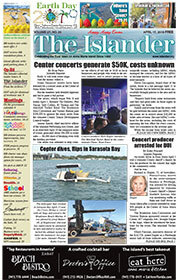 Jason Stock is on patrol in the offshore waters of Anna Maria Island. Migratory species are in abundance, producing great action. Blackfin tuna, kingfish and amber jack are all worthy of even the strongest anglers, giving them a run for their money. Throw in a few bonito, permit and a goliath grouper and, Stock says, the only thing you’ll want to be lifting is a 12-ounce can of beer. 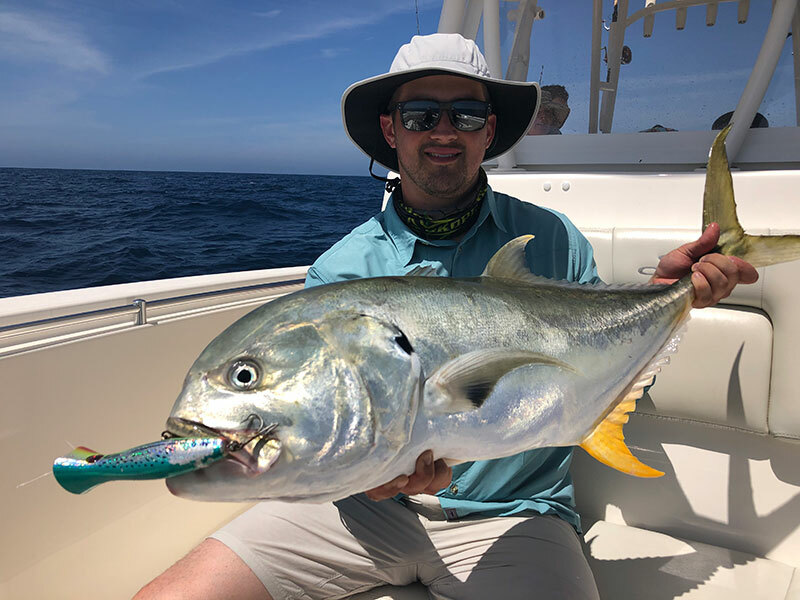 Most catches are occurring while live-bait fishing although artificials are worthy of attracting a bite — especially on the tuna, bonito and amberjack.